This is a trend I've noticed in a lot of F/W 2010 shows. Not only the camel coat, but the camel everything. I liked it right from the start, when I first saw this Chloe outfit. It's such a warm and cozy color, and it basically represent autumn, really. The atmosphere this camel color gives out is so cozy and warm. I especially like the coat in the first picture, the coat has a shape, and it almost looks like a blazer. 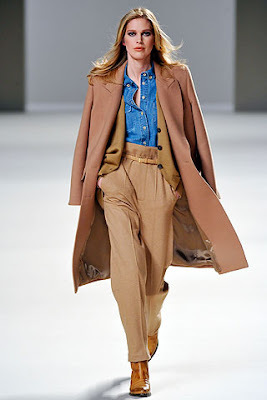 Like a developed version of the boyfriend blazer, that is turned into a camel colored coat. 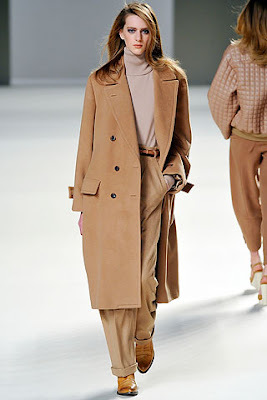 Chloé's F\W 2010 fashion show had LOTS of camel, it gave off a 'camel is the new black' kind of feeling. Now I just need to look around to find an affordable yet perfect camel coat.